Site24x7 launched its brand new website officially last week (14th April). The content, style and the layout have undergone drastic changes. 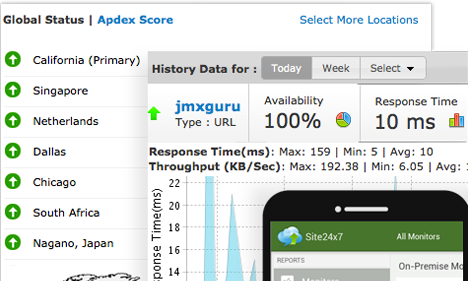 'Monitoring Availability and End User Experience Made Simple' on the index page signifies the unique capabilities of Site24x7 that allows users~ to experience four solutions in one console: Website Monitoring | Server Monitoring | Public and Private Cloud Monitoring | Application Performance Monitoring. Our new website boasts of some cool videos too that might keep you hooked. This is in addition to the all new pricing page that went out same time last month. The Tools page have also been revamped keeping in mind the theme of the website. There are a total of 17 tools categorized into System Administrator Tools, Validation Tools and Content Tools. The only thing that remains unchanged is that we still provide some awesome service and remain true to the fact that "Your monitoring needs may differ, but the solution is the same". Experience all these changes on our new website and let us know if you found the navigation easy and enriching. If you don't have an account, go ahead and sign up for 30-days FREE trial.